Do you think that are you a good motorcycle rider? Now, you have the best opportunity to find out in the new game Bike Trials Offroad 2. A lot of adventure is waiting for you, divided into several levels. Levels are dynamic and there are plenty of obstacles ahead. Perform some amazing stunts with your motorcycle or ATV across 20 tracks filled with dangerous obstacles. Jump off ramps. How do you deal with jumping bridges, moving boards or jumping through rocks? Pass all levels as fast as possible. Earn money for every race and buy new, better motorbikes. Enjoy a realistic simulation of driving and do not let anything stop on your way to success. 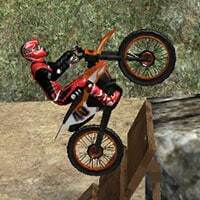 So have fun in playing Bike Trials Offroad 2 Game. Make sure to check out the 1st version: Bike Trials Offroad Game. Use arrow and WASD keys to control. R to restart and ESC to pause or go to the menu. SPACE to jump.